The beautiful Cinque Terre, five villages clinging to the mountain as if they're about to fall into the sea. Very fertile ground (presumably due to vulcanic origins), on steep mountains, slowly built into terraces over hundreds of years. The unusual and awe-inspiring landscape is a natural park with Unesco world heritage site status. 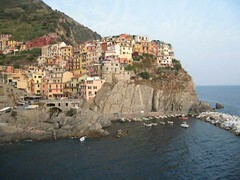 The villagers have done a good job of developing tourism in the Cinque Terre, without spoiling it. Funnily enough, it attracts far more foreigners than Italians, and some Italians who do come are disappointed, the friendly owner of our hotel (Ca D'Andrean, recommended BTW) told us, shaking his head. "They expect a Cinque Terre golf resort, a Cinque Terre tennis clubs, and they think that it's five islands!". The average Italian tourist is a comfort creature. There are plenty of American tourists instead, many tracing their roots. 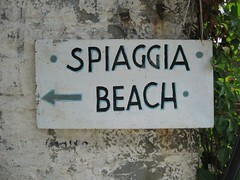 Sometimes it can be a bit maddening, especially in Riomaggiore, which was dominated by the Let's Go! crowd - east coast college backpackers, partying hard. But since each village has its own character, it's easy to find the right one for your mood. So opposite poor Riomaggiore, there are Vernazza and Monterosso, on the posh side of the spectrum, catering for the upmarket crowd. Two espressos and one focaccio, ten euros anyone? 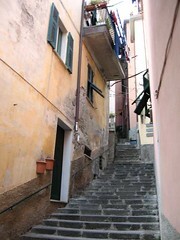 Then there is Corniglia, very cute, and the only village on top of a cliff instead of against one. To get anywhere you have to walk fourhundred steps down, and up again. 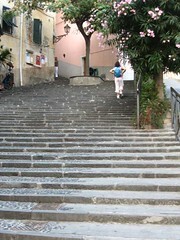 We were very fortunate that we had chosen Manarola (pretty much at random); almost as cute and unspoilt, with less stairs. This was taken in july. 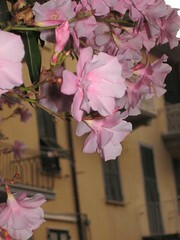 Must be fabulous with the flowers here in springtime. 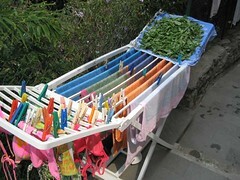 We followed our nose to find this drying rack in a little alley in Corniglia. Someone was going to make some great pesto. On the left a photo taken on a walk through the terraced vinyards. Manarola harbour. Looks like a postcard, doesn't it? This is not a place for cars, the only ones allowed are locals, for loading and unloading only. Instead, to get around, you hop between the villages by boat or train. The train line is spectacular. It tunnels underneath the villages, straight through the cliffs, opening up occasionally. 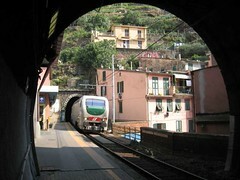 This tiny stretch between two tunnels is the Vernazza station! Was it touristic? Yes. But despite the backpackers and the posh crowd, there is plenty of tranquility in normal life at a leisurely pace. The boats in the harbours are not just for show; fishermen still fish. 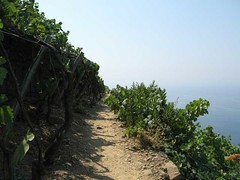 The paths through the terraced vinyards are the only way to get to the grapes. The village bar is frequented by tourists and locals alike. 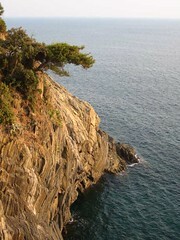 And so is the coastal stroll, aka la via dell'Amore. Life is good. Posted on 11:09, 05 august 2006.